Upcoming events and exhibitions for Orlando-based artist Rachel Simmons. I am headed to Tampa tomorrow morning for a two-day workshop at the University of Tampa. Printmaker Ryan McCollough and his students will be participating in FLOCK, a socially engaged art project which encourages participants to think about their relationship with birds. The UT students and I will spend time talking, birdwatching and making new bird prints to add to FLOCK. When I return home, I'll install their contributions to FLOCK at the Orlando Science Center on wires stretched across the gallery. Each participant will also fill out a bird survey as well. "Everybody knows the red head, that conceited rural dandy"...is a caption describing a woodpecker's flashy plumage, part of which became the title of my most recent artist's book, Conceited Rural Dandies. The phrase, and many others found in the book, originated from The Book of Birds, Volumes 1 & 2," a 1932 National Geographic publication in which birds are described in human terms. It was selected for inclusion in the project by a group of about 12 student collaborators from Lawrence University in Appleton, WI, during the time we spent together through Benjamin Rinehart's Paper Fox Printmaking Workshop in October 2016. In this artist’s book, text and image was paired and layered to help the viewer explore some of the artifacts from the cultural history of birdwatching. Through a vellum layer of recreated field guide drawings and early 20th advertisements for feather-filled ladies' hats, the viewer can see letterpress-printed text, originally composed to describe birds as virtuous, vain, responsible and even caring. The original poem on the first page draws the connection between ladies' hats and birds by imagining why these stylish dressers would eventually trade fashionable feathered hats for binoculars. It sets the stage for the borrowed captions which often refer to birds as humans, discussing their devoted parenting skills, their propensity towards narcissism or rudeness, and even stereotypical ideas of masculinity & femininity. The unique cyanotype covers in this edition of 15 were also a collaborative venture; the Lawrence students created cut-out shapes echoing birds and bird habitats, and the cyanotypes were a result of collaging these shapes together and then exposing the paper to light. As with many of the socially engaged projects from The Language of Watching, Conceited Rural Dandies began with birdwatching along the Fox River in Appleton, Wisconsin, an activity which brought birds and birdwatching to the attention of the project participants. In a larger sense, it was an excuse to go outside and think about our connections to the natural world for a while. As a symbol of nature, and as some of the most ubiquitous creatures on earth, birds are very accessible to humans. Their sometimes eerily familiar behaviors are very relatable, which makes it easy to connect with them. Since birdwatching began as a conservationist movement and hobby in the early 20th century, those who observe birds have anthropomorphized their behaviors in endlessly creative ways. In Conceited Rural Dandies, the captions we included almost read like poetry as they elegantly and humorously communicate a sincere desire to connect with birds by seeing them as an extension of ourselves. Though birdwatching—if one browses contemporary field guides—seems to have evolved into more of a competitive sport than these early soft-hearted musings about birds, today's birders still connect with birds in very personal ways. Why do birds still capture our admiration? Maybe we are the "conceited dandies" who judge bird behaviors as good or bad, helpful or villainous; we feel compelled by our own vanity to assess their survivalist behaviors by our social standards. Or maybe we just admire the freedom they have to fly away from the earth to which we are naturally tethered. Either way, as part of The Language of Watching, this work encourage participants to see birds as an integral part of nature, and for a few moments out of our busy lives, re-examine our symbiotic relationship with nature. To purchase a book from this edition of 15, please inquire at rsimmons@rollins.edu. At this year's SGCI conference in Atlanta, I sold several broadside prints in support of the ACLU. I am happy to report that I sold enough of these prints to donate $120.00 to that organization. I wanted to give a shout out to my fellow printmakers for supporting this initiative, and to encourage others to do the same. I decided to do this because I wanted to use my professional skills as an artist and scholar in a very direct way to support an organization that protects our civil rights and serves us when we are most vulnerable. I believe that if you care about a cause, your art practice can directly support that cause. You can link your practice to a purpose. There have been three projects in the body of work The Language of Watching so far. The first was in July 2015 at Constellation studios in Lincoln, Nebraska during which I launched The Survey, FLOCK and created the artist's book A Survey of Popular Birds & Their Behaviors. The next cycle came later that fall when students in my 2D Foundations course at Rollins College elected to join the project and expanded FLOCK for an exhibition at the Cornell Fine Arts Museum. 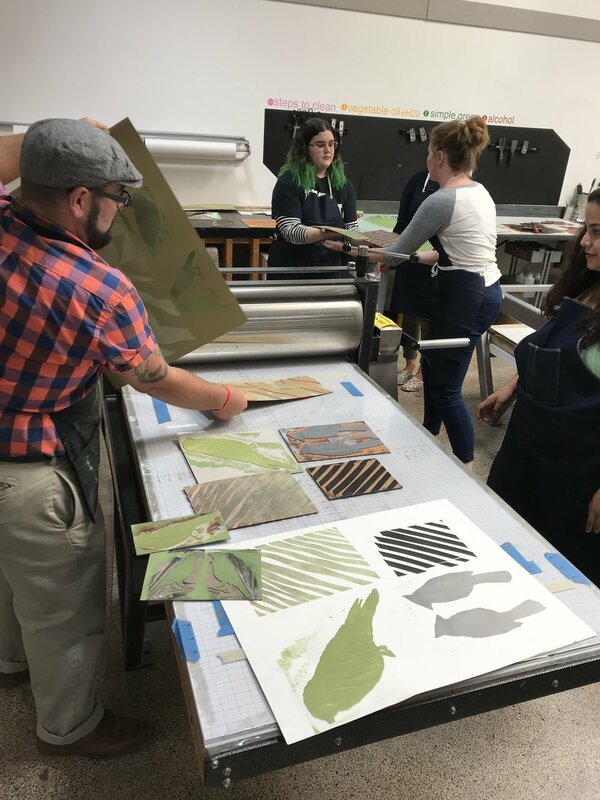 And this October, students at Lawrence University joined Mass Migrations by birdwatching, filling out surveys and collaborating on a new artist's book edition supported by the Paper Fox Printmaking Workshop. The process for this third cycle of the project was based on my experiences with the previous two, and included the group birdwatching excursion, discussion and reflection, and an examination of the 1932 publication The Book of Birds Volumes 1 & 2 to facilitate awareness of the ways in which humans impose our cultural and social norms, biases and stereotypes on bird behaviors through anthropomorphized descriptions. My art practice have evolved over the years, gradually moving away from a solitary studio experience (a common model in graduate school) towards inclusivity and interaction with communities. I am interested in creating opportunities where viewers can become active collaborators, breaking out of traditional roles as passive consumers of art. My current focus has been on creating print and book-based works through shared experiences and collaboration. The work that my collaborators and I make together are vehicles for generating awareness, both of ourselves and our place in the larger context of the natural world. In past projects, my topics have included ecotourism, marine pollution and global warming. Most recently, however, I have turned to the topic of bird behaviors and the culture of birdwatching through an ongoing project titled The Language of Watching . The ubiquitous nature of bird species makes a perfect topic to explore our connections with the natural world. In addition, the language of birdwatching field guides are reflective of our tendencies to characterize bird behaviors as we would human behaviors, with all of the social, cultural, and even political judgements that come with doing so. In this way, birdwatching has become a subculture that opens up dialogue about why we seem to identify animals as an extension of ourselves. The Language of Watching always begins with an introduction to my practice and an overview of the project. Then we begin to share stories about birds. 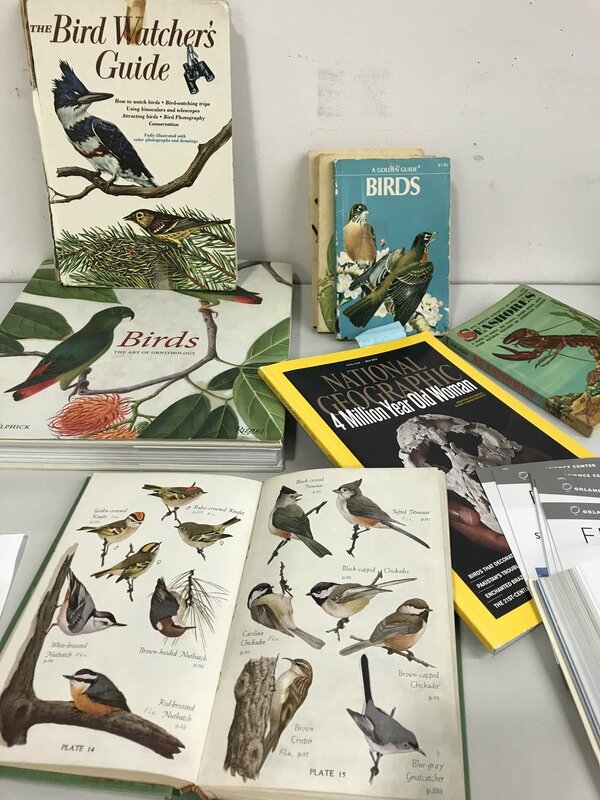 Sometimes we sit around a studio work table to talk and other times we might stroll down a tree-lined path, stopping along the way to identify the sources of birdsong we hear. At Lawrence, the local birder group loaned us several pairs of binoculars to share, so we headed outside for a walk along the Fox River. It was a cool and breezy day in October, and most trees still had vivid green leaves. Birdwatching is an exercise in mindfulness, in actually stopping to notice what is around you using both through sound & sight. Likewise, once we are back in the studio to work, the project extends that mindfulness towards thinking critically about birdwatching as a cultural pastime which leads to shared discoveries in printmaking. After birdwatching, students were asked to read and choose illustration captions from The Book of Birds which seemed to read more as descriptions of human behaviors, not simply those of birds. After each student chose a caption (sometimes amused or incredulous at the barely hidden biases and stereotypes they found in the 1930's era language), others chose the best 6 captions to set with movable type. These would be featured in the final versions of the book. As they set type for the captions, I set a background for the book using type, ornaments and die cuts from Lawrence's letterpress collection. In addition, the students were also introduced to a photographic process called cyanotype, which we used to create covers for the books. The imagery we made for the covers included all things "bird,: i.e. talons, feathers, plants, trees, eggs and beaks. Now I'll be working on assembling the edition, sending half of the edition of 20 back to Lawrence's Paper Fox Printmaking Workshop which supported my visit; the work will be included in their artist's book collection and copies will also be sold to support the program. Yesterday I received a thank you note from the Lawrence students and their professor, my friend, Ben Rinehart. They thanked me for "sharing my expert art skills" & for helping them better understand my art practice. It was a sweet letter. And I have to say, the feelings are mutual. I learned a lot from our time together, too. Doing socially engaged work is a natural fusion of my teaching & studio practices. And paper Fox offered exactly the right kind of experience, at the right time, and really has helped solidify the direction for this work.